Milan: Feltrinelli Editore,, 1960. Introduzione di Michele Pacifico. Octavo. 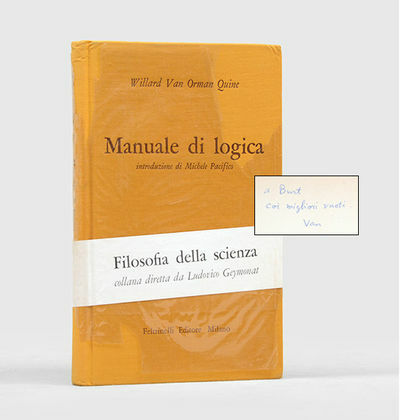 Original yellow cloth, titles to spine and upper board in brown. With the original glassine dust jacket and wrap-around band. Bump to top corner, contents faintly toned. An excellent copy in the chipped glassine jacket. First Italian language edition, first impression. Originally published in the US in 1959. Inscribed by the author on the front free endpaper, "a Burt coi migliori vuoti, Van". The recipient was Burton Dreben, an influential Harvard professor and Quine's "closest philosophical ally".